Plastic recycling bins with a range of coloured lids and a range of labels to suit any recycling requirement. Lids fit both sizes of waste bin and holds internal bag in place. Can be easily set together to create a recycling station. 30L bins = H x D x W: 415 x 320 x 410mm. 50L bins = H x D x W: 620 x 320 x 410mm. Recycling should be second nature in the workplace now, but making it simple with easy to identify and use bins is the ideal situation. Our open top recycling bins are a great addition to the workplace, simple to use and colour coded to help segregate waste. They also come with a range of labels to suit any recycling requirements, and help to identify what materials should be placed in the bin. 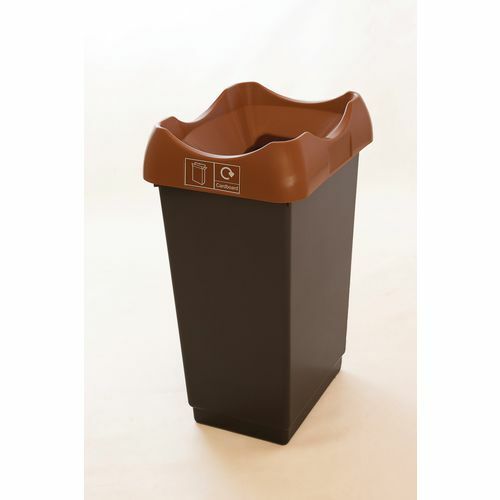 Two excellent features of these recycling bins are that they have an easy to wipe down plastic finish and they can be easily set together to create a recycling station. There are two sizes to choose from; 30 or 50 litres and the lids fit both sizes of waste bin and holds an internal bag in place. Finally there are seven lid colours to choose from; black, blue, green, red, yellow, brown or lime. Our open top recycling bins are an ideal solution for making recycling simple and creating an easy way to separate waste for disposal.